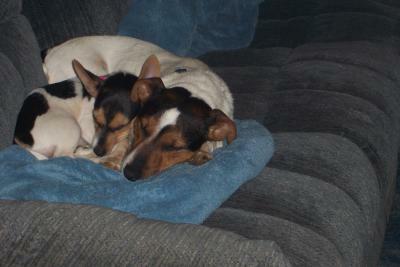 Jay Jay & Lil' Bit taking a nap! My two babies. Lil' Bit is my new female. Jay Jay is the perfect father figure. I hope she turns out as sweet and smart as him! Karen that is so precious! I'm going to put Lil Bit in December's Jack of the Month since you have one entry already of Jay Jay. Thank you for entering this of Lil Bit. I just want to cuddle up with them, but who could possibly want to disturb such a darling scene? Oh my god that is the cutest picture in the world!! !